I was talking with a friend earlier this week about the issues he was having with his dryer. Because I am an insurance agent, that got me thinking about how many home insurance claims are a result of fire damage, so I did a little research. Here it is. -Spoiler Alert! If you have kids, read this to them tonight. I promise they will be out in less than 7 minutes. 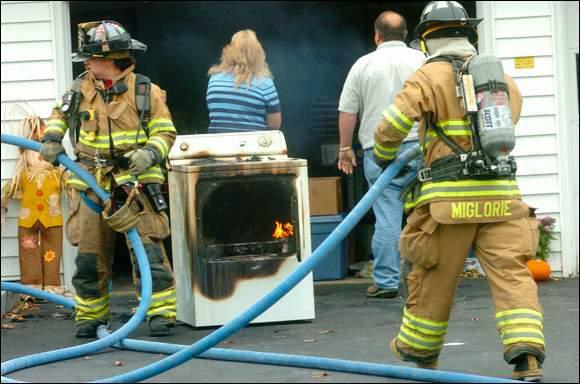 *84 percent of clothes dryer fires occurred in residential buildings. *The number of such fire incidences in residential buildings was higher during autumn and winter, with the peak of 11 percent occurring in January. *28 percent of the incidents reported had dust, fiber and lint as the items that caught fire fastest in the clothes dryer fires in residential buildings. This was closely followed by items of clothing that were not worn by any person, featuring in 27 percent of the cases. *The clothes dryer fires in residential buildings which were limited to the first object that got ignited and did not spread to other items accounted for 54 percent. *Lack of sufficient cleanliness in the dryer was the top cause of clothes dryer fires, accounting for 34 percent of the cases in residential buildings. Why do Clothes Dryer Fires Occur? The most common reason for these damaging fires was the negligent upkeep of the clothes dryer. Not all the lint is trapped by the filter; much of it has a tendency to collect inside the machine and worse still, directly on the heating element. If the machine is not cleaned and serviced regularly, the volume of lint builds up inside it and blocks the flow of free air. The chance of a spark getting ignited is high since lint is a very combustible material. The airflow can also be reduced by the presence of rugs backed with foam or athletic shoes in the clothes dryers. Incorrect installation of the open end of the vent hose on the roof leads to rain water and debris clogging the vent. Sometimes, small birds and animals make their nest or bed in the exhaust vents of these dryers. This poses a severe fire hazard as well. When the clothes dryer having a blocked vent is switched on, the exhaust gases will not have an outlet to escape. This can lead to overheating, which in turn can trigger a fire. Vents that are made of plastic tend to be flimsy; they can get easily crushed, thereby blocking the exit for the lint and air. These materials might even be flammable. How can Clothes Dryer Fires be Prevented? Due to the extremely high number of such fires in recent time, the USFA is attempting to spread mass awareness about the proper use of clothes dryers. While faulty appliances are the cause in some cases, users can prevent a fire most of the time through proper precautions, usage and maintenance of their clothes dryers and dryer vents. While clothes dryers were kept in the basement in the past, they are now being placed in other areas of the house, such as bathrooms and bedrooms which are quite a distance away from an outside wall. This means the dryer vent is much longer and possibly has more bends to accommodate the structure of the house. Lint tends to collect more in these longer vents and boosts the chances of a clothes dryer fire in the house. People should give careful consideration to this fact while getting their dryers installed. Keeping the dryer vent hose as short and straight as possible is a great preventive measure for such fires. Vacuum cleaners and other gadgets are available to remove the lint that accumulates inside the dryer. These should ideally be used after each run of the dryer. The vent hose of the clothes dryer also needs to be replaced periodically, since the warm air coming into this relatively cooler tube causes condensation that encourages lint to line up along its interior. If the clothes take much longer to dry than usual or if they get over-heated, it is an indication that the clothes dryer needs maintenance and/or repair. This not only minimizes the chance of a fire within residential buildings, it also boosts the efficiency of the clothes dryer and gives it an extended life. Some of the tips for safe usage of clothes dryers are plain common sense, like switching the clothes dryer off before leaving the house and when sleeping. The smoke detector alarm should be checked to see if it is in proper working condition. The instruction manual should be read thoroughly before use. The safest alternative is to hang washed clothes on the clothesline to dry. The extra wrinkles and creases can be dealt with using a good steam iron.